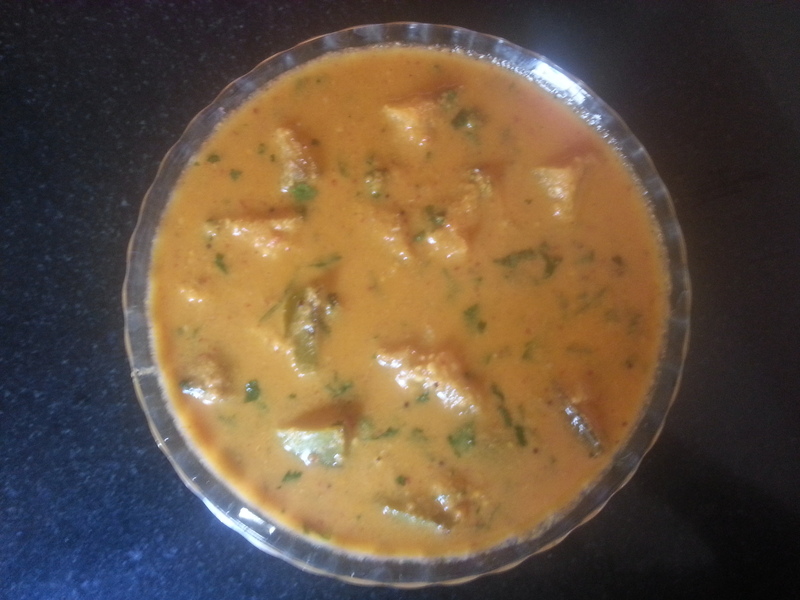 Try this….Sambar. It’s easy, different, delicious! Made without using dhal. Just one type of vegetable and a bit of grinding that does wonders!! While the boiling sambar does most of your job, don’t miss taking note of the pointers given at the end of the recipe. Wash brinjal, curry leaves and coriander leaves in water. Drain the water. Cut each brinjal into 8 pieces. Boil them for about 6 to 8 min. in a vessel along with water, turmeric powder, tamarind paste, salt, curry leaves, green chillies and jaggery. Grate raw coconut. Dry fry dhania. Grind the above ingredients along with red chillies, initially without using water and then continue grinding using approx. 50 ml water. Mix this ground chutney to the cooked but still boiling brinjal. Also add little more salt and tamarind paste (refer ingredients list for approx. quantities) and continue boiling for few more minutes. Can you sense that splendid smell of sambar? Now is the time for seasoning…..
For this, heat ghee or coconut oil in a small skillet. Put mustard seeds. When they crackle switch off the burner. Now add asafoetida and immediately pour over the cooked brinjal sambar. Wow…. Delicious Brinjal Sambar is now ready! Also view recipes of “Beetroot Sambar“, “Gherkins Sambar“, Onion Tomato Sambar“, “Ridge Gourd Huli Thovve” and “Khara Kootu” in this blog. You can adjust the quantity of salt, chillies and tamarind paste depending on your choice. Do not miss the special instructions given on splitting the total quantity of salt and tamarind paste to be used. To reduce the bitterness of brinjal (if required) after slicing them, sprinkle salt evenly over it and mix thoroughly. Leave it for 10 min. and rinse well before use. Green round variety of brinjal used in this recipe is also known as “Matti Gulla”, grown in Udupi district of Karnataka State, India. Eggplant or brinjal is also called by other names like Aubergine (in the western part of the world) Baigan (in India) etc.